A business contract termination letter is used for the purpose of notifying and terminating any contract entered into by two businesses. 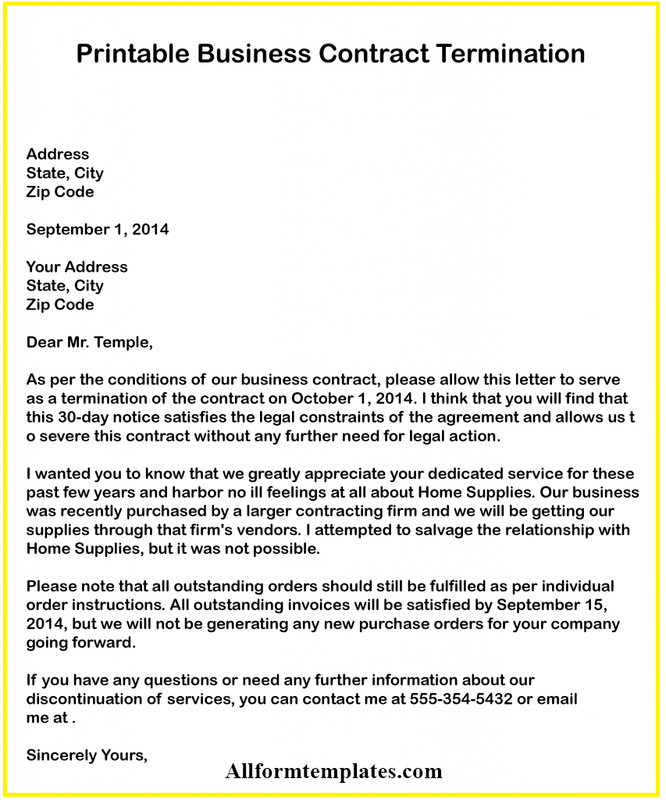 So today we shall be sharing with you some Business Contract Termination Letter in HD quality. It falls under the category of other termination letters such as employee termination letter, service termination letter, etc. 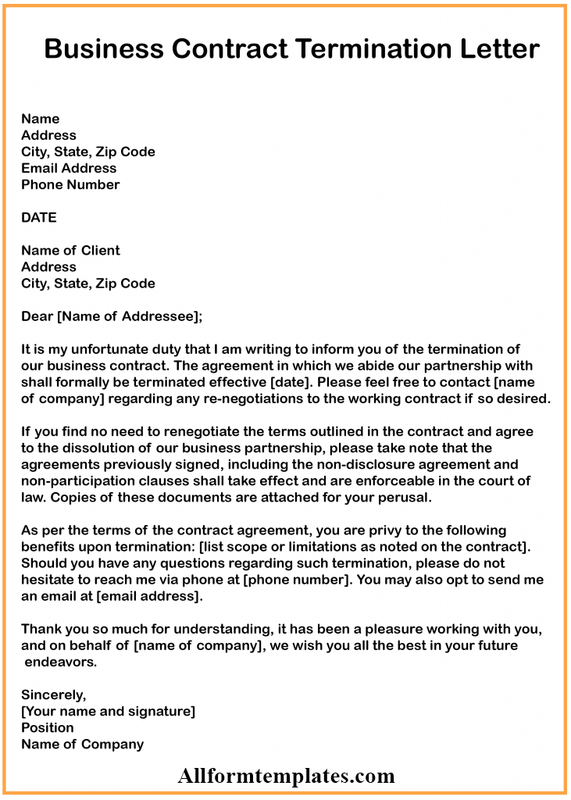 A business termination letter is a formal way of ending a contract in the corporate sector. So in case you want to end a contract with a business, you must provide them with a contract termination letter. 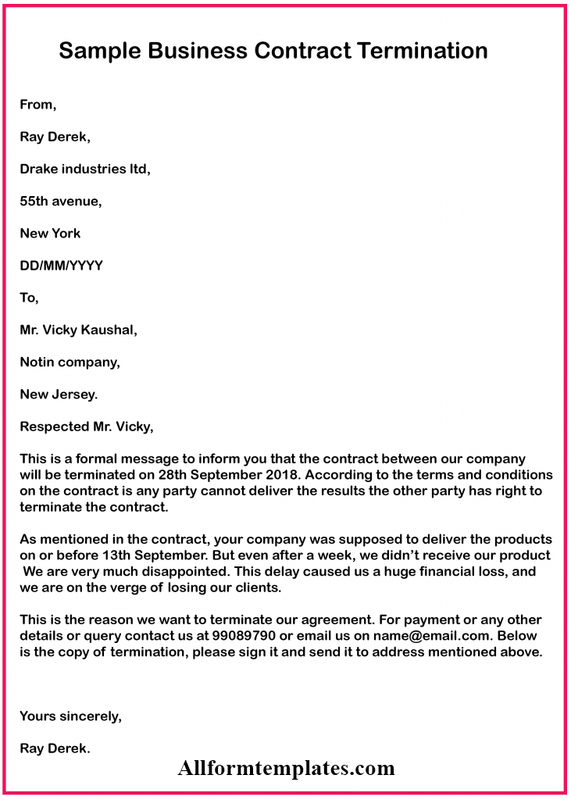 Here you can find some samples of contract termination letters which you can use in your day-to-day transactions. In a business termination letter, a business writes about the reason for termination and bring an end to a partnership or collaboration. You must express the reasons clearly otherwise it might affect your relationship with the person or organization. Since it is a formal letter, it must follow a protocol and written in a formal manner. Since the termination of a contract will alter the legal relations between two businesses, hence it is ideal to consult a lawyer before writing a termination letter. He will help you to clearly state the terms and conditions of the contract and the provision in the same which can lead to the termination of the contract. It is very important to explain the reasons for termination very clearly, or the other party might file a suit against you. when the term fo the contract has ended. when the other party has indulged in fraudulent activities, or through his act shown that he is not willing to fulfil the conditions of the contract. when any law comes into practice which makes the fulfilment of the contract by both the parties impossible. This letter must be addressed to the higher authorities, i.e., the senior management of the company. It should be written in a formal manner and the tone must be kept polite. Use of harsh or derogatory words must be avoided. So to help you understand how to write a contract termination letter better, here we have provided you with an example template which you can download and print in PDF. A business contract letter can have a positive ora negative impact on your relationship with the business, If written in a harsh tone or haphazard manner, it might strain your relationship with the business. Hence particular attention must be given to the words and language used. In case you are terminating the contract due to incompetence or inability of the other party to fulfill the contract, you must provide them with another chance if possible.